JB Ranch is a new 55+ community being developed by builder D.R. Horton in Ocala, Florida. When completed, this active adult community will have 346 single-family homes. Active adults will love a number of amenities at the community's clubhouse and will enjoy their excellent location just ten miles from historic Ocala, Florida. Many of JB Ranch's amenities will be located in its proposed clubhouse. Here, residents will be able to gather for community meetings or make use of the kitchen to cater parties and events. A fitness center will provide opportunities for exercise and physical fitness. Outside of the clubhouse will be an outdoor pool and patio area. When completed, JB Ranch will have 346 single-family homes ranging in size from 1,641 to 2,034 square feet. Though started by Armstrong Homes, the community is now being completed by D.R. Horton. Four different single-level floorplans will be available with two to three bedrooms, two bathrooms, and attached two-car garages. All models feature spacious first-floor master suites with his and hers walk-in closets available with most models. Homes at JB Ranch also feature open floorplans with generous great rooms and kitchens. Residents will enjoy a low-maintenance lifestyle thanks to the homeowners' association, which will provide lawn care and watering as well as exterior home maintenance. This will allow active adults more time for the activities they love, like enjoying Florida's abundant sunshine at the outdoor pool. Residents will be able to make use of the clubhouse for social gatherings and meetings as well. Ocala, Florida is known as the "Horse Capital of the World." The thriving horse industry provides residents with many opportunities for riding or visiting horse farms. In the downtown area of Ocala, residents can find dining, shopping, and cultural events. Downtown Ocala's "Brick City" offers more than 20 shops and restaurants in a charming historic setting. This 55+ community will have easy access to Highway 200 and Interstate 70. A Publix grocery store is just over three miles away along Highway 200. Just a little farther along this road, there are hardware stores, a movie theater, several department stores, and many restaurants. Munro Regional Health Center is a short four-and-a-half mile drive to the southwest. For active adults seeking to further their education or explore a new hobby, the College of Central Florida is nine miles away and offers a variety of courses and lectures. 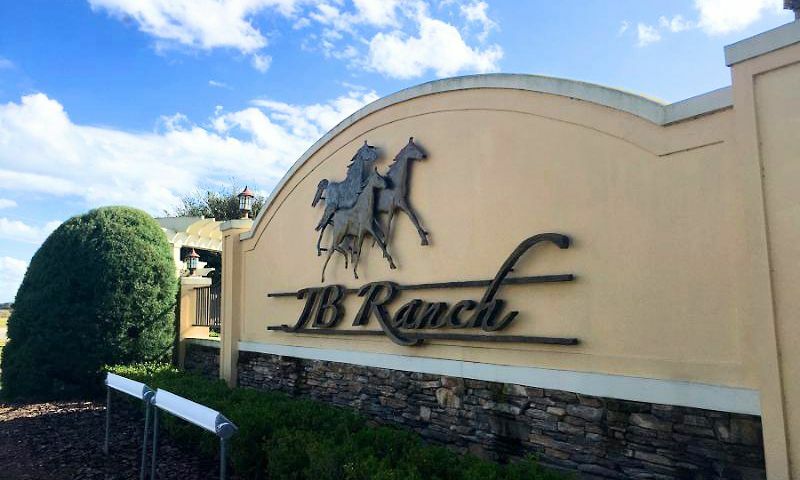 JB Ranch is sure to be a great active adult community in Central Florida. Check back soon for more information on the lifestyle in JB Ranch. Single-family homes will range in size from 1,641 to 2,034 square-feet with two to three bedrooms, two bathrooms and attached two-car garages. All models feature spacious first-floor master suites with his and hers walk-in closets available on most models. Homes at JB Ranch also feature open floorplans with generous great rooms and kitchens. 55places.com is not affiliated with the developer(s) or homeowners association of JB Ranch. The information you submit is distributed to a 55places.com Partner Agent, who is a licensed real estate agent. The information regarding JB Ranch has not been verified or approved by the developer or homeowners association. Please verify all information prior to purchasing. 55places.com is not responsible for any errors regarding the information displayed on this website.